Home RV Advice Fired up! What a busy month! Since I last shared my adventures with you a lot has happened – mostly good but one a bit scary. The scary one was when I attended the 10th anniversary muster of the ACC Gippsland Gypsies at the lovely Glen Cromie Caravan Park on the banks of the Tarago River, Vic. The anniversary was going well, although we were near a big bushfire. During the Saturday night dinner, ACC member Derrick gave a fascinating talk on the formation of the branch at the Warragul Caravan Park and we all enjoyed a great catered dinner. The next morning, the sky was full of the smoke from the fire and the owners of the park asked us all to leave. They had experienced a similar fire a few years back and lost cabins in the blaze. Fortunately it didn’t reach the park this year but better safe than sorry. The highway back to Melbourne was closed and we had to travel via Korumburra – a good thing from bad as I have friends there and was able to spend the rest of the day with them. Doug cooks a great barbecue, though he lets me cook my own steak! Doug is a member of the Korumburra Showgrounds Committee and was partly responsible for getting a dump point installed in the showgrounds, helped by a subsidy from the CMCA. 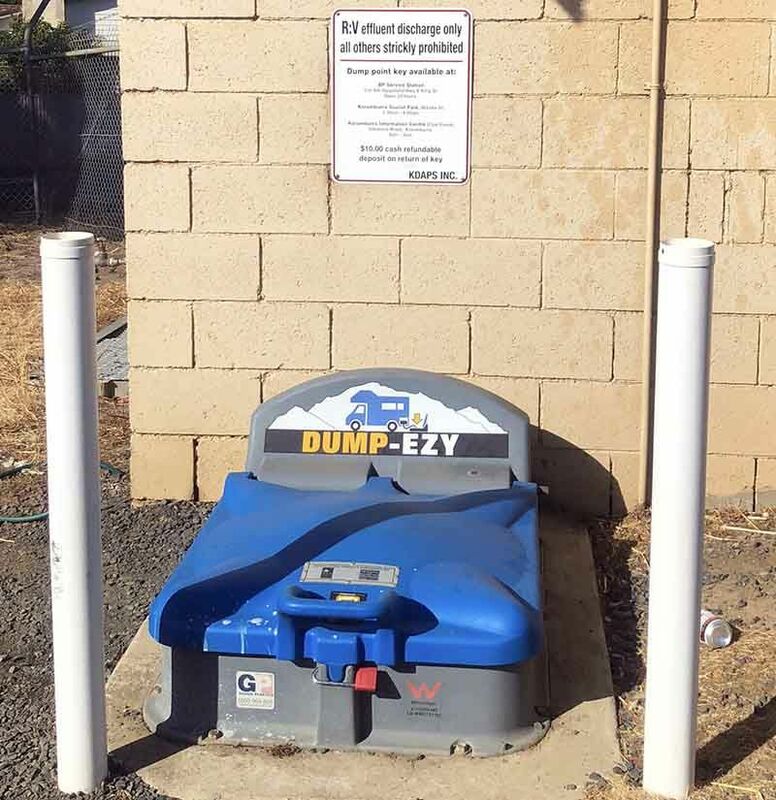 Unfortunately, red tape has meant that the dump point has to be locked at night, although a notice tells you how to get a key. Numerous approaches to the council and the water board have failed to get this ridiculous decision reversed. The following weekend saw me heading to Adelaide where I spent an enjoyable four days with my son and daughter-in-law. Saturday night saw us dining at a lovely Chinese restaurant with stunning views over a marina and surrounding fabulous homes by the waterside, while on Monday night we feasted on Indian cuisine at the famous Bombay Cycle Club. Tuesday was different. I was elected chef and we had a gluten-free spaghetti bolognese – yes, there was a celiac in the house and hence no gluten. Keeping up my walking regime, we went for a lovely long walk along the Semaphore beachfront but I was a tad worried when I saw this sign along the path! I spent the next week in the Murray Bridge Caravan Park and Marina on the banks of the Murray River and what a great week it was. Chugging along the mighty Murray. One of the many highlights was a cruise on the Murray aboard a paddle wheeler. The trip included a beautiful two-course lunch as we chugged peacefully along the broad waters of the river. Murphy was on board with us and took the opportunity to trip me up on one of the sills in the doorways. Only my pride was hurt but the lady who distracted my attention as I negotiated the doorway blamed herself for my trip and was quite concerned for my welfare for the rest of the muster. Murph also had a hand in wrecking my telly and antenna! TV reception was very patchy in the caravan park and I got a few channels from my little interior antenna but none from my mast one. Help from a few friends didn’t solve the problem but by then the constant changing of the antenna broke the inlet on the telly. A visit to Big W saw a new, slightly larger set installed but by then the external antenna was tested and found wanting. Mr M was gloating by now but continued his nefarious activities by causing my van’s ‘through-the-wall’ connection to fail as well! It’s now fixed and a plate made to support the bigger telly to the swivelling wall mount. A new antenna has arrived and, after a marathon struggle with a new cable with a short in it through the wall causing lots of angst, it all works. Thank you, Murphy! Another highlight was a visit to ‘The Bend’ – a new motor-racing circuit at Tailem Bend, SA. It is a lovely track and I would have loved to have been able to drive a few laps in one of the fabulous historic racing cars on show. We were given a guided tour, although I was stopped in my tracks when sneaking up the stairs for a better view from the hotel-type suites up there. The week ended with a lovely farewell dinner at the Murray Bridge Club and the company on my table was great. Back home and it was still eventful – a visit from Cheryl and Bruce, friends I’d made a couple of years back when they were broken down at my favourite caravan park in Walkamin, Qld. They called in on their way home to Adelaide after a trip that included the Ballarat Boronia Festival. 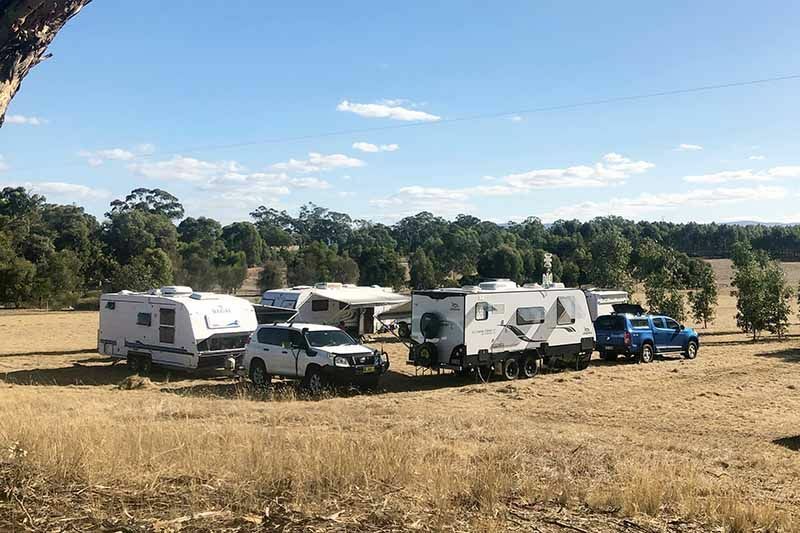 The week concluded with a visit to my ‘farm stay’ by a cluster of four caravans: seven ACC members from Brisbane on tour. ACC Lone Trekker Di also called in for a night before heading off to Barcaldine for the world record attempt for the longest line of RVs. They were lovely people and I shared happy hours with them and acted as a tour guide the day they visited the nearby Grampians and Horsham. When my wife Vi and I lived in Harrogate, UK, our niece Linda was just a baby. That was a long time ago but recently Linda sent a photo of Vi and I on our wedding day. Lionel and Vi on their wedding day. It awakened a lot of memories – thanks Linda. I’m currently exploring what further steps I can take. Lionel Mussell has been RVing around Australia for decades, first in a caravan and nowadays in a motorhome. He is also one of the founders of the Australian Caravan Club (and still and active member! ).